What is more comforting than a bowl of macaroni and cheese? Not a whole lot! Like many others, my favourite type of macaroni has always been Kraft Dinner. Nevertheless, Kraft Dinner isn’t something I make often. With a food philosophy rooted in holistic nutrition, I tend to feed my body with ingredients that will allow it to thrive. With this conclusion I made the healthiest, perhaps, obnoxiously healthy, Easy Vegan Mac + Cheese. The ‘cheese’ sauce is made up of cauliflower, beets, and cashews. I know, it doesn’t sound like it can be delicious but it has just the right spices and added flavours to make it wonderful. This recipe is a good example of why I love plant based food. You can be as creative as you want and surprise your taste buds. Cauliflower and cashews blended together create a silky and creamy sauce, and yellow beets and turmeric are natural food dyes. Nature is the best pantry we got. We just need to explore it. For this recipe is used Banza elbows made from chickpeas. 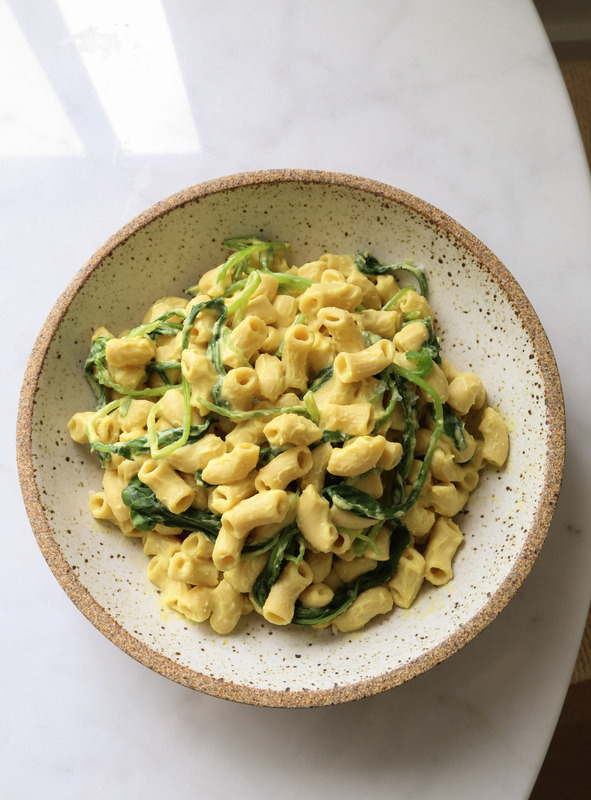 I love Banza pasta because It’s gluten-free, has a great taste and texture, and it’s high in protein, fiber, and lower in carbs than regular pasta. However, feel free to use your favourite pasta in this recipe. There are so many alternatives to wheat pasta in health food stores. It’s fun to explore and see what’s right for you. In order to amp up your greens, try adding a bunch of spinach to the pot during the last 1 minute of cooking the pasta. Easy Vegan Mac + "Cheese"
Place the cauliflower, beet, and cashews in a large pot covered with water. Bring to boil and then simmer for 10 minutes, or until cauliflower and beets are fork tender. Drain and blend in a high speed blender. Add almond milk, nutritional yeast, yellow miso, paprika, turmeric, garlic powder, onion powder, and acv to blender. Blend everything until very smooth. Add more milk if sauce needs to be thinned out. Season as necessary. Set aside. Cook the pasta according to package instructions. Drain and coat pasta with cheese sauce. You may not need all of the sauce. Enjoy! This entry was posted in Main Dishes and tagged Autumn, beets, cauliflower, comfort food, easy recipe, local, macaroni, plant-based, quick and healthy, seasonal, Vegan, vegan cheese, wholefoods. Bookmark the permalink.